RTG has just launched a great new slot game and South Africa’s Springbok Casino has got a nice bonus for everyone that wants to try it! The new casino game is called Double Ya Luck and it combines slot machine fun with board game dice. Until the end of the month, get up to R1500 to try it! When animated dice symbols appear they trigger the unique Board Game Feature. You'll roll the dice to move around a game board winning instant prizes like bet multipliers. Prizes are doubled when there’s an animated Wild symbol in the winning combination. 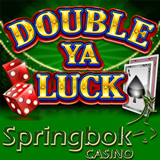 Springbok is the only online casino where the house currency is the South African Rand. Desktop and laptop players can choose from hundreds of games and 23 games are available in the mobile casino for iPhone, iPad, Google Nexus and Samsung Galaxy players.